This is one of the many novelty releases from Carlton Ware in their 'Big Foot' series manufactured in the 1970s. 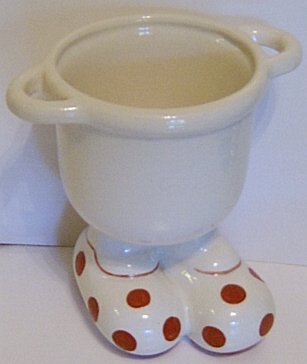 Designed by Roger Michell (Lustre Pottery) for Carlton Ware , this particular piece is a Toothbrush Holder with the very collectable large red-spotted shoes. This is a deep cup with a thick rim and ring handles either side. Its overall height is approx 4.75 inches (12 cms). The Cup is in excellent condition. It is backstamped and shows the date 1973.